Bob has over 30 years of experience in the courtroom. 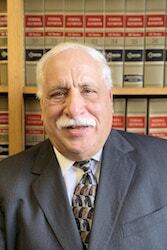 His career has been primarily in the personal injury area, although he has handled commercial cases as well. Before coming to CGM, Bob was an Assistant District Attorney in the Homicide Bureau of the Bronx County District Attorney's Office. Later, he served as a Special Counsel to the New York Stock Exchange. Bob has tried cases to verdict in virtually all of the counties in the New York metro area. One of Bob’s trials in Federal Court was selected to be telecast live on Court T.V. He is knowledgeable in all types of accident cases, including construction cases and cases involving heavy equipment and machinery. One of the matters Bob handled resulted in a $7.2 million award for the client. In preparing and trying cases, Bob’s focus is on identifying the key issues of the case. Before trial, he analyzes the strengths and weaknesses of the case to develop an appropriate strategy. His approach is to maximize a case’s strengths but always be mindful of potential weaknesses. His ultimate goal is to prepare thoroughly and present what happened to the jury truthfully, clearly and convincingly to get the best result possible for the client.